The interesting twist to this launch is that the bag has two compartments. In one is the seafood item, either a salmon fillet or calamari rings, while in the other is a sauce. During cooking—in either microwave or conventional oven—the seal between the two compartments breaks so that fish and sauce are united. Sirane has established itself in the ovenable bag space over the past few years. But typically the protein—fish, chicken, meat—goes into the same compartment as the sauce. The dual-compartment format grew out of a request by a large retailer in the UK. “They came up with a delicate watercress sauce that got too fishy when fish and sauce were in one compartment,” says Balderson. “The fish, too, lost some of its texture by being submerged in the sauce. To produce the Woolworths bag, Sirane purchases the necessary substrates in rollstock form. Selective coating is folllowed by adhesive lamination. As for filling of the bags, it’s done manually. In-house engineers at Woolworths came up with a semi-automatic system of heat sealing by means of a foot-pedal-operated device. Sealed bags are placed in a foamed EPS tray and then a paperboard sleeve is applied. 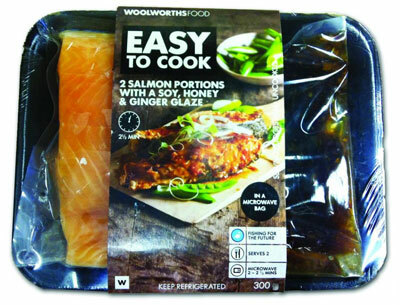 Woolworths launched its two seafood items just a few months ago and is already looking at broadening the range to include chicken.